The Shovbin is a unique combination of a shovel and bin. 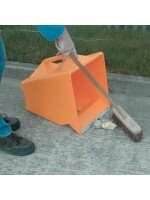 Ideal for collecting rubble, rubbish, water or other materials. 84 Litre capacity. Depth 355mm - Width 457mm - Height 483mm.